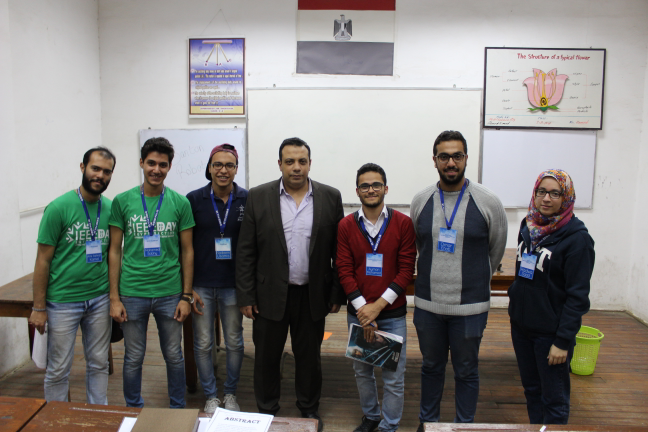 Prof. Mohamed Gaber Abou Ali, the Dean of the faculty of Engineering, assigned a group of students the task of participating in the Science and Engineering Fair (SEF) which was held in Victoria College in Alexandria on Saturday 18/11/2017. The faculty students were asked to select the top projects done by school students of Montaza Educational Administration in the field of Engineering. These top projects will be further scrutinized to choose the most outstanding ones to participate in the Intel International Science and Engineering Fair (ISEF) that was organized by the Egyptian Ministry of Education, in collaboration with, the Ministry of Communication and Intel Multinational Corporation. 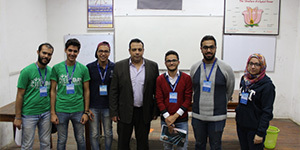 The faculty of Engineering was represented by Dr. Mohamed El- Kholy, the Head of the faculty delegation to the fair, along with ten students members at the Institute of Electrical and Electronics Engineers (IEEE). The delegation examined the projects of the school students and provided them with the needed support and technical recommendations. More than 100 projects from different schools of Montaza Educational Administration took part in the competition. The faculty students capitalized on this fair to introduce the school students to the faculty of Engineering at Pharos University and its study programs. PUA students also referred to the continual support and encouragement the faculty of Engineering gives them to participate in the local and international Engineering competitions. The school students showed great interest in this participation on the part of the faculty and seized this opportunity to know more about Pharos University; faculties and study programs. By the end of the visit, PUA staff awarded the students who achieved the best project a commemorative plaque and took a photo with them for memory’s sake.